Yesterday, it was unseasonably warm here in Detroit, making it up into the mid-50s. The chance to get out of the house certainly helped break up the winter malaise. The sun didn’t have much to do with it I’m sure, but spirits were higher on the stock market than they’ve been in quite some time. Let’s get into the headlines. Home prices were up 0.3% on a seasonally-adjusted basis despite being flat overall in September. Across the 20-city index, the rate of annual appreciation slipped 0.4% to 5.1% in September. The index was fairly uneven. Phoenix saw gains of 0.9% as did Las Vegas in September. Atlanta and Tampa also saw strong performance. On the other hand, Seattle and San Diego have seen prices fall over the last three months. On a yearly basis, Las Vegas is out in front with gains of 13.5%. Meanwhile, San Francisco prices are up 10%. Despite recent drops, Seattle is still close behind, up 8.4% on the year. New York and Washington, D.C. trailed the field at 2.7% and 2.9% annual price growth, respectively. The monthly rate of appreciation in prices according to the Federal Housing Finance Agency was slightly better than that in the S&P index, up 0.2% on the month and rising 6% on the year. However, monthly growth missed expectations and the annual figure is the weakest since January 2017. Prices in the Mountain region were up 1.3% in September and have gone up 9.5% since the same time a year ago. Meanwhile, the Pacific region took a step back, down 1.1% on the month and rising only 5.5% on the year. The Mid-Atlantic region is bringing up the rear in terms of yearly growth at 4.1%. It was up 0.4% in September though, beating the overall index. Consumer confidence had a bit of a dip in November, falling 2.2 points to come in at 135.7. However, this isn’t far from the highest levels the index has seen. The current conditions component was up 0.8 points to 172.7. Meanwhile, expectations for the future were down 4.1 points to 111. When looking at current conditions, 1.2% less consumers see jobs as hard to get, bringing the total to 12.2%. Meanwhile, 46.6% of consumers say there are a lot of jobs available, making for a 1.2% rise. On the future expectations side, fewer people see their incomes rising in the next six months. They’re also was positive about the number of jobs opening up in the near future. Inflation expectations were up 0.1% to 4.9% in this sample. Meanwhile, 74.4% of consumers think interest rates will climb the next year, up 1.2%. In terms of buying plans, 6.4% consumers are planning to buy a home soon. Finally, only 35% of people see the stock market rising over the next year. It was a big week for mortgage applications which were up 5.5% overall. The number of refinance applications rose up 1%, while the bigger boost came from a 9% increase in those looking to buy a home. The percentage of applications to refinance reached its lowest level in 18 years, down 0.6% to 37.9%. Meanwhile, the average interest rate for a 30-year fixed conforming mortgage fell 4 basis points to 5.12%. In another preliminary reading for the third quarter, analysis revealed the economy grew at a rate of 3.5% for the quarter, in line with expectations. Inventories contributed 2.27% to the total GDP growth. Meanwhile, net exports were a bit bigger weight on the numbers, pulling 1.91% away from the overall number. Consumer spending was only up 3.6%, versus 4% on a seasonally-adjusted basis in the last estimate. This made the contribution of consumer spending go down 0.2% to 2.45% of the GDP number. Meanwhile, prices for consumers are judged to have risen 1.7% on the quarter in the latest numbers. Residential investment had less of a detrimental effect on GDP in this revision, as it was seen to have only dropped 0.1%. Meanwhile, business investment contributed 0.35% to the overall GDP number, a bit more than the first testament. The government contributed 0.44%, slightly less than the last time this report was issued. The U.S. goods gap widened by $1.2 billion in October to $77.2 billion. Exports fell 0.6%, while imports were up 0.1%. On the export side, at $140.5 billion, these are up 7.8% from last year. Exports of food, feeds and beverages were down 6.9% to $10.3 billion and are down 2.8% on the year. Exports of capital goods and cars fell along with consumer goods and industrial supplies. This broad downturn is thought by analysts to possibly be an effect of the ongoing tariffs between the U.S. and other countries. Imports were up 0.1% at $217.8 billion in October. These have risen 10% on the year. Consumer goods imports were up 3.5% to $57.4 billion. Car imports in particular were up 2.3%. Meanwhile, there seems to be less money being poured into businesses as capital goods imports were down quite a bit. It wasn’t a good month for new home sales in as they came in at 544,000 on a seasonally-adjusted annual basis. This is down 9.7% for October. Offsetting this a little is the fact that that there was a total of 50,000 more sales counted in upward revisions for August and September. Sales of new homes have been in decline, down 12% on the year and falling from a high of 712,000 last November. Prices were also down 3.6% in October and have fallen 3.1% on the year at a median of $309,700 in October. Builders are slowly beginning to discount prices to get a sale. Prices may have further to fall as there is suddenly 7.4 months’ worth of supply in market if sales were to continue at their current pace. In the regional data, sales in the South were down 7.7% on the month and Hurricane Michael may have had something to do with that. But there were more severe declines in the Midwest and Northeast, while the West also saw a drop. Initial jobless claims were up 10,000 to 234,000 last week. This is a higher-than-expected number and the four-week average was up 4,750 to come in at 223,250. This is the highest it’s been since July. Continuing claims weren’t any better. They were 50,000 higher at 1.71 million. Meanwhile, the four-week average of continuing claims was at 19,750 to come in at almost 1.668 million. Personal incomes were up 0.5% in October. Sole proprietors made more money and there was more interest earned, but wages and salaries were only up 0.3%. On the consumer spending side, this rose 0.6% in October. Perhaps people were working to get a jump on their holiday spending. There was also a 0.7% increase in spending on services. The Federal Reserve pays a lot of attention to this report in judging the effects of inflation. Prices are up 0.1% in key categories and 0.2% overall. On the year, inflation has risen 1.8% in core categories while up 2% overall. Both numbers came in slightly lower than expected. In a bad sign for future readings of existing home sales. This measure of homes with a purchase agreement in place for sale was down 2.6% on the month to an index level of 102.1. Peeking at the regional data, pending sales are weakest in the West, down 8.9% on the year. The Midwest and South are also showing with the Northeast being the only region to show a slight yearly uptick. In a bit of general mortgage news, the FHFA announced changes to the limits for conventional loans backed by Fannie Mae or Freddie Mac that will apply from now through 2019. The increased limits mean more buying power feel looking to purchase and the chance to take more cash out if you’re looking to refi. Loan limits for FHA and VA loans are expected to be announced soon. Turning back to mortgage rates, they were relatively flat last week. This has been a nice respite from what had been a steady climb higher. If you’re in the market for a purchase or refinance, it’s a good time to lock your rate. The average interest rate on a 30-year fixed mortgage rates 0.5 points paid in fees was unmoved last week at 4.81%. This is up from 3.9% at this time a year ago. Looking at shorter terms, a 15-year fixed mortgage with 0.4 points averaged 4.25% last week, up a single base this point. Last year, the rate was 3.3%. Finally, the average rate on a 5-year treasury-indexed, hybrid adjustable rate mortgage (ARM) with 0.3 points was up three basis points on the week and has risen from 3.32% last year. The market was optimistic about the idea of a trade deal between the U.S. and China taking place at the G-20 summit. This good feeling flowed over so that the market had its first good week in a while. We’re winding down to the final weeks of the Fantasy Stock League. If you haven’t looked in a while, the uptick might make it a decent day to look at your portfolio. The Dow Jones Industrial Average rose 199.62 points Friday to close at 25,538.46, up 5.16% on the week. Meanwhile, the S&P 500 closed at 2,760.17, up 22.41 points on the day and 4.85% on the week. Finally, the Nasdaq was up 5.64% on the week after rising 57.45 points on the day to finish the week at 7,330.54. There aren’t as many economic reports this week as last week, but as usual, we get a key report on manufacturing as well as the number of jobs added to the economy in the first week of the month. 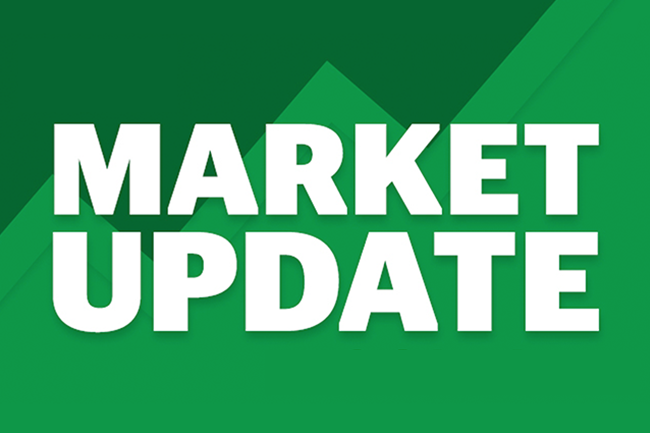 We’ll have it all covered for you in next week’s Market Update! Although informational, we’re aware that this isn’t the most scintillating reading. We’ve got plenty more home, money and lifestyle content to share with you if you subscribe to the Zing Blog below. Are you looking to get a start on that holiday shopping? Check out our holiday gift guides. Here’s one with some great gift ideas for children. Have a great week!